Pecan Springs Ranch is located on the banks of Chambers Creek, a tributary of the Trinity River. The land features pastures and timbered areas, as well as hills, springs, and bodies of water. The Republic of Texas originally granted much of the property to Charles Merlin, an early arrival to Texas. It was later sold to Nicholas P. Sims and remained in the Sims/Campbell family for over one hundred forty years until its sale to Ted and Nancy Paup in 2012. The property is located on L. R. Campbell Road, named for one of the previous owners. 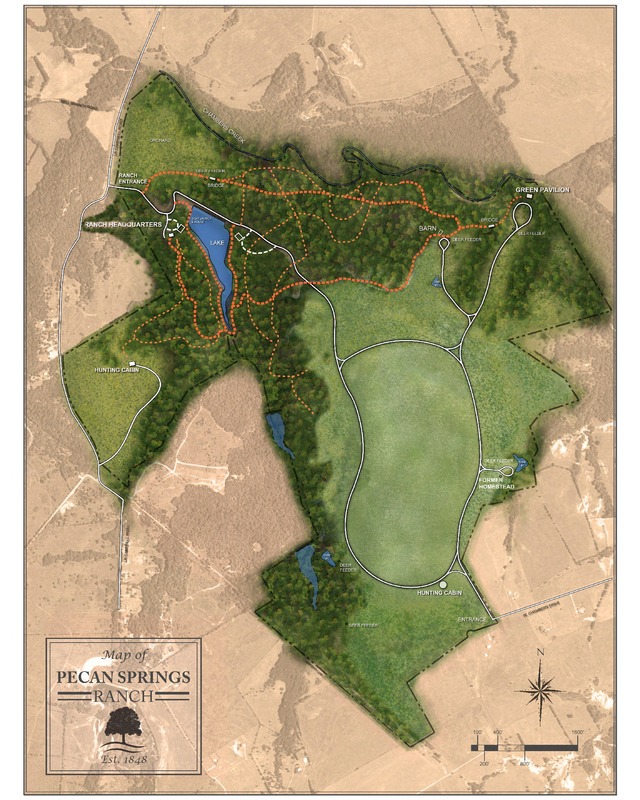 Pecan Springs also has the distinction of being situated on the historic Shawnee Cattle Trail. Texas ranchers drove longhorns through this area on their way to market from the 1840’s until shortly after the Civil War. The prairie grasses provided cattle herds excellent grazing while Chambers Creek provided a welcome place to rest and water the cattle. i Bob Jones Nature Center, “Cross Timbers Ecosystem: A Natural Wonder!” http://www.bjnc.org/about-cross-timbers.php (accessed April 2, 2015). ii Texas Parks & Wildlife, “Cross Timbers and Prairies Ecological Region,” https://tpwd.texas.gov/landwater/land/habitats/cross_timbers/ecoregions/cross_timbers.phtml (accessed April, 2 2015). v Texas Parks & Wildlife, “Post Oak Savannah and Blackland Prairie Wildlife Management: Historical Perspective,” https://tpwd.texas.gov/landwater/land/habitats/post_oak/ (accessed April 2, 2015).